NEW BRITAIN — Polamer Precision, Inc. has signed a long-term agreement with jet engine manufacturer Pratt & Whitney, a division of United Technologies Corp. Under the agreement, Polamer will manufacture complex bearing compartment hardware for the PurePower Geared TurboFan TM engine family for the Airbus A320neo, Bombardier CSeries, Embracer E-Jet and Irkut MC-21. Polamer’s President and CEO Chris Galik said the contract is estimated to generate $140 million in revenue over its term that starts this year and runs through 2022. “This contract deepens Polamer’s participation in the program and is another step forward in the company’s strategy to be a fully-integrated supplier in Pratt & Whitney’s PurePower engine program,” said Galik. 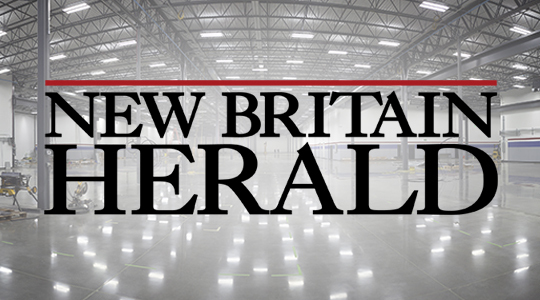 Parts will be manufactured in Polamer’s new facility, located in The Pinnacle Business Park in New Britain. The new 152,000-square-foot facility includes 22,000 square feet of office space. The building is highly energy efficient and has installed one of the largest industrial solar power generation systems in the state. With the consistent growth demonstrated over the past three years and the move from Newington to the new facility, Polamer plans to expand their workforce significantly by December 2016. Polamer currently uses state-of-the-art machining practices coupled with the latest machine tools and equipment available in the marketplace. Galik believes that offering its employees the best in class equipment with a state-of-the-art facility will result in a dedicated workforce. Bill Carroll, business development director for the city of New Britain, said he wasn’t surprised about the agreement. “These awards pay tribute to the hardworking people and successful programs and projects that are stimulating new jobs and investments in our economy,” CERC President and CEO Robert Santy said at the time. Polamer manufactures high-quality engine and airframe components for delivery to customers worldwide. The company combines its engineering capabilities with the latest technologies to ensure “mistake-free processes,” timely delivery of products and cost efficiency.